Hooray for Flip and Flop! As a French teacher, I teach students from ages 5 to 13. And while I know that each child learns at their own pace, I often take for granted that, by the time they reach grade 1 or even 2 depending on their learning abilities, they have mastered a very difficult learning milestone - reading. I never really knew how hard it is to teach a child to read until I had a child of my own. I have always been eager to teach my daughter the alphabet and promote an early love of reading, especially since I struggled with reading when I was a child. But it hasn't been until my daughter started Junior Kindergarten this year that she is actually learning (and loving) phonics. At her school, they use the Jolly Phonics program and I always rejoice when she comes home and shows me the new letter sound under study. She's so excited about it, too. And now, it's been about a week or two that she is decoding words entirely on her own. 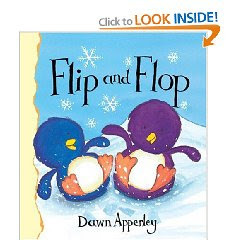 For Christmas, her teacher gave her a copy of Flip and Flop written by Dawn Apperley. She has read it about 3 or 4 times now and feels so proud knowing that she can read entire sentences. I couldn't be more thrilled! I use this book for guided reading, since there are many words that are intimidating such as spluttered, thought, and excitedly. But there are also some repetition and fun-sounding words like wheeee and boomba, which she thoroughly enjoys. And for those of you who love books by Robert Munsch, I just thought I would throw in this link to Kidspace from the Toronto Public Library site where you can access animated versions of his wonderfully illustrated books online and listen to the author read them himself. It's a great site and it also features a wide array of books from several different authors. Just look under "Read-a-Story," click on "Tumblebooks Library" and then click on "Story Books" to view them online. I cannot express the joy I felt when I read what she wrote. It is a true marvel and blessing to be able to witness this ongoing learning process through the eyes of a 4-year-old and the pride she feels throughout her journey when she has accomplished something truly remarkable. Madeleine, when you read this in the (near) future, I want you to know that I am so proud of your accomplishments! This looks like a book my son would like. So sweet. He really loves penguins!